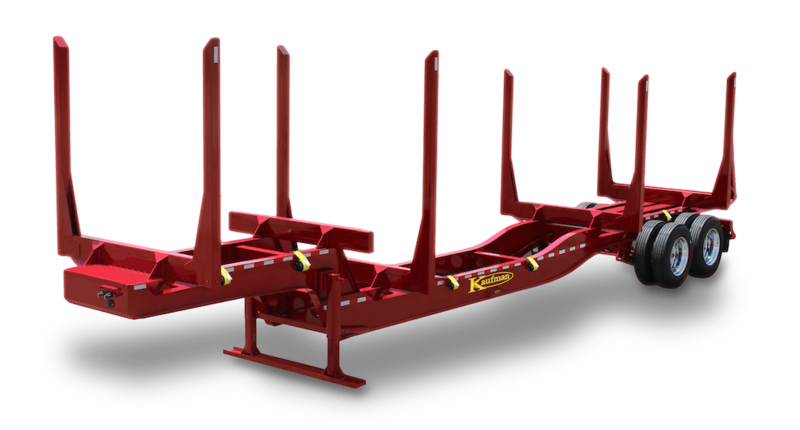 Kaufman Trailers Plantation Log Trailers provide a 24″ drop behind the gooseneck. This style of log trailer is popular for loading thinnings behind the step with full length logs on top. There is not a trailer in the industry that will provide this much space for loading plantation thinnings behind the gooseneck. A full range of suspension options are offered. The standard suspension is a heavy duty, underslung, 4-spring Hutchens H-9700 suspension. We also offer two popular optional suspensions: Watson single point or Ridewell air ride suspensions. These options are available for a nominal up charge. The main frame is constructed with two 21” deep, high tensile, fully fabricated main beams and full depth cross-members at each bolster, as well as a fully fabricated, high tensile gooseneck. You will also be happy with the “dummy” bolster on the top of the gooseneck for hauling your double bunk or short log loads. Our plantation log trailers are the most versatile forestry trailer in our log trailer lineup. See our ads for Plantation Log Trailers in The Truck Paper, Southern Loggin’ Times, and Lumbermen Online. Optional color up charge for any color other than standard black. Call for details. Frame (2) - 21" nominal Main-frame full length beams, fabricated with 130 KSI high tensile flanges and 80 KSI high tensile webs.